Grab your gal pals and leave your fellas at home – it’s a girls night out. 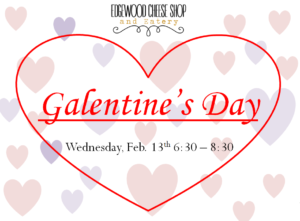 We’ll have a great cheese and charcuterie spread plus a chocolate filled dessert bar! Also, The Veiled Crow will be open next door if you wish to purchase a mini-reading. As always we are byob so feel free to bring your beverage of choice.